Even though long, dark green, smooth-skinned garden cucumbers are familiar vegetables in the produce sections of most groceries, cucumbers actually come in a wide variety of colors, sizes, shapes and textures. You’ll find white, yellow, and even orange-colored cucumbers, and they may be short, slightly oval, or even round in shape. Their skins can be smooth and thin, or thick and rough. In a technical sense, cucumbers are actually fruits, not vegetables. (Fruits are parts of flowering plants that come from the ovary.) But we’ve become accustomed to thinking and referring to cucumbers as vegetables. All cucumbers belong to the botanical plant family called Curcubitaceae. This broad family of plants includes melons and squashes. The cucumbers we’re most familiar with in the grocery store belong to the specific genus/species group, Cucumis sativus. Pickling is a process than can be used for many different foods. It’s not limited to cucumbers and or even to the vegetable food group. In general, the word “pickling” refers to a method of preventing food spoilage that involves soaking in a liquid and/or fermenting. Fermented pickles are often called “brined pickles,” but here’s where confusion can set it. These two terms aren’t truly interchangeable since some brined pickles are “quick brined” and haven’t been given time for fermentation. When pickles are “quick brined,” the brining solution usually contains a significant amount of vinegar, and it’s this added vinegar that prevents the pickles from spoiling, not build up of lactic acid through the microbial fermentation process. Non-fermented pickles of all kinds—often referred to as “quick pickled”—rely on the addition of vinegar or another highly-acidic solution to prevent spoilage. “Quick pickling” with the use of vinegar can be accomplished in a matter of days. Pickling by fermentation usually takes a minimum of several weeks. If you would like to learn more about how pickled cucumbers compare in nutritional value to raw cucumbers, see this Q+A . While genetically engineered cucumbers do exist, genetic engineering is not responsible for the existence of seedless varieties of cucumbers. Through a natural process called parthenogenesis, cucumber plants can fruit without pollen. In the absence of pollen, seeds do not develop in the fruit. While some people have a personal preference for seedless cucumbers, it’s worth remembering that cucumber seeds are rich source of cucumber nutrients that are sometimes absent in the pulp and skin. Sometimes you will hear the word “gherkin” being used to refer to cucumbers and pickles. This word can be used to describe a variety of cucumber that comes from the same plant species (Cucumis sativus) that is the source of most other cucumber varieties found in the grocery. But the term “gherkin” can also be used to describe a cucumber variety that comes from a different species of plant (Cucumis anguiria). For an in-depth nutritional profile click here: Cucumbers. Since cucumbers can be very sensitive to heat, you'll be on safer grounds if you choose those that are displayed in refrigerated cases in the market. They should be firm, rounded at their edges, and their color should be a bright medium to dark green. Avoid cucumbers that are yellow, puffy, have sunken water-soaked areas, or are wrinkled at their tips. We address the issue of seeds and skins in our "Healthiest Way of Preparing Cucumbers" section below. But during the selection process, you may find it helpful to know that thin-skinned cucumbers will generally have fewer seeds than those that are thick-skinned. Cucumbers should be stored in the refrigerator where they will keep for several days. If you do not use the entire cucumber during one meal, place it in a tightly sealed container so that it does not become dried out. For maximum quality, cucumber should be used within one or two days. Cucumbers should not be left out at room temperature for too long as this will cause them to wilt and become limp. Two common questions about cucumbers involve consumption of their skin and their seeds. There are several facts you need to know before making your decision about consumption of cucumber skins and seeds. First, it is important to remember that the skins and seeds of cucumbers are both rich in nutrients. In fact, the nutrient richness of both plant parts is significantly higher than the flesh. For this reason, consumption of both skins and seeds is desirable from a nutritional standpoint. 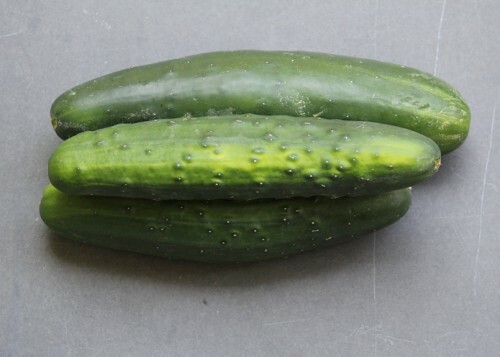 Both conventionally grown and organically grown cucumbers may have been waxed. However, the only waxes that can be used on organically grown cucumbers are non-synthetic waxes, and these waxes must be free of all chemical contaminants that are prohibited under organic regulations. Conventionally grown cucumbers may be waxed with synthetic waxes that contain unwanted chemical contaminants. For these reasons, we recommend leaving the skin of organically grown cucumbers intact regardless of whether the organically grown cucumber has been waxed. For conventionally grown cucumbers, we recommend removal of the waxed skin. For conventionally grown cucumbers that have not been waxed, we don't have a good research basis for recommending either removal or non-removal of the skin. However, if you do decide to consume the skin of a non-waxed, conventionally grown cucumber, we recommend thorough washing of the whole cucumber under cool running water while gently scrubbing with a natural bristle brush. Some people have a personal preference for removal of cucumber seeds, and we respect this preference. The seeds can easily be removed from a cucumber if it's cut lengthwise and the tip of a spoon is used to gently scoop out the seeds. Our general recommendation, however, is to keep and consume the seeds, since they are an unusually rich source of nutrients. Getting optimal nourishment from your cucumbers while minimizing your health risks will mean choosing organically grown cucumbers over conventionally grown varieties.